Well, yes I’m that crazy to make Turkish Delight Recipe from scratch! Why do I bother to make this addictive Turkish treat when we can easily find it at any candy shop or even at markets? If you are a real foodie and if you have a strong interest in food, you just can’t beat the curiosity inside you about learning how something is made. So this homemade Turkish Delight stuffed with ground pistachio came out of my culinary curiosity. I do love that curiosity inside me. So do my family and friends! I’m sure they didn’t believe that I would succeed when I revealed my plan about trying homemade pistachio Turkish delight recipe. I must admit that it was a challenging one and I had to try it twice to reach the result I wanted. Please don’t get discouraged, it really is worth making especially if you are not living in Turkey. You will love it more than the Turkish delight you buy from a Middle East market or online. To tell you the truth, people visiting Turkey from all around the world love this unique dessert way more than Turkish people do. Maybe because we have been enjoying it for ages, maybe because it’s everywhere here, it doesn’t get that much interest from us. We do love it with a cup of well prepared and foamy Turkish coffee though. Saying not easy, I don’t mean that it’s a laborious recipe. The hard thing is that you should watch it closely and stir frequently when it starts to thicken, so you shouldn’t go out of the kitchen for long. Also, you should take it from heat at the right time when it’s neither too silky nor too stiff. Turkish delight is often sold in small cubes plain or containing nuts. 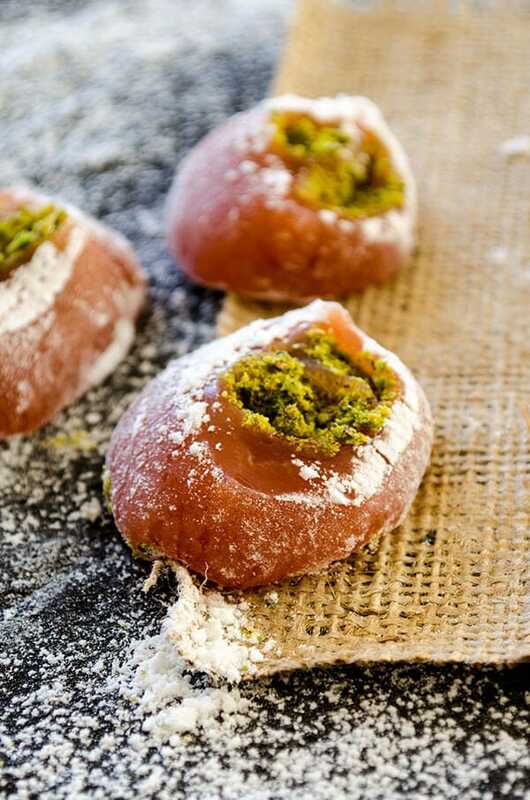 You might also see the ones stuffed with ground pistachio, walnut or hazelnut. I will be sharing the recipe of that stuffed one in this post. If you want yours plain, just leave the stuffing step out and cut it into cubes. 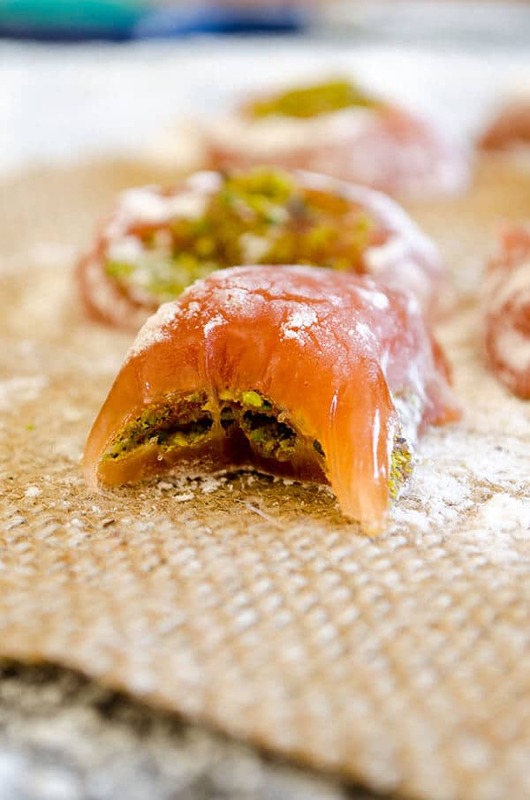 You should decide on the pan before starting to make your pistachio Turkish Delight. It should be a deep one to give your Turkish delight enough thickness. I used a 24x15cm deep pan for these measurements. Line it with parchment paper and brush it with almond oil. Why almond oil? It doesn’t have a strong taste, so you will not feel it when eating your Turkish delights. 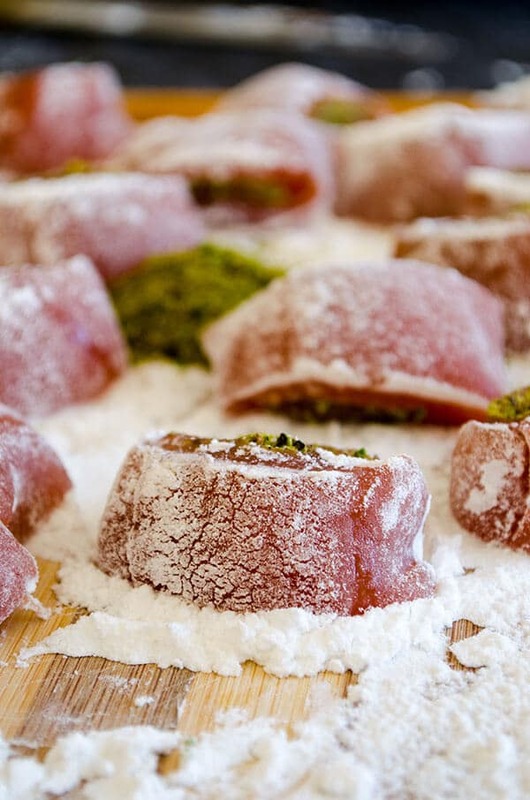 We need a key ingredient for making this Turkish delight recipe: cream of tartar. I had no idea where I could find it before. I couldn’t find it at supermarkets here as I expected. I searched on the web and I learnt that I could find it at herb and spice shops which we call “aktar”. You can imagine how much I thank to the seller when I finally bought my cream of tartar. I was ready to make my own Turkish delight now! In a typical Turkish delight recipe, rose water is like a must, but I didn’t use it as I don’t like its scent much. I used a little red food coloring, but it’s optional. It has a very nice glittering color without the food coloring, so you can just leave it that way. I must thank to Fahriye’s Kitchen for guiding me making lokum at home! Turkish Delight rolled out and stuffed with ground pistachio. Line a 24x15cm pan with parchment and brush it with almond oil. Combine lemon juice, sugar and 250ml water in a deep pot on medium heat until sugar dissolves. Bring it to medium low heat and let it simmer for 1 hour stirring constantly until it reaches 240F on a candy thermometer. Don’t take it from the heat yet. Meanwhile combine cream of tartar, corn starch and remaining 250ml water until smooth. When the simmering syrup reaches the right consistency, pour a ladle of syrup into starch mixture and whisk it fast. Repeat it a few times until the starch mixture warms up. When it’s completely whisked and warmed up, pour it into the simmering syrup in very little amounts stirring constantly. When the mixture starts to boil, bring the heat to the lowest and let it simmer for 1 hour whisking constantly. You will see a caramel color and it will be difficult to whisk when it’s done. Whisk in the food coloring or leave it as is. Pour it into the prepared pan and spread evenly. Let it sit overnight uncovered at room temperature. The top should be hard at the end of this time. Wait it longer if it’s still sof tor sticky. Combine powdered sugar with corn starch in a bowl or on the counter. Dust scissors with sugar and starch mixture and cut it into squares and toss them in the same mixture if you like it plain. Continue reading if you want to stuff them with pistachio. Take the stiff mixture from the pan with the parchment under it. Roll it out just like a regular dough. Don’t make it very thin. Put ground pistachio on one end and roll it up tightly. Coat it with sugar-starch mixture and cut with scissors. Toss them in the same mixture and serve. Store them with a good amount of sugar&starch mixture in an airtight container up to a month. Hi Zerrin, I tried this recipe, I think the Corn Starch mixture must be heated separately then added to the sugar mixture, can you please confirm ??? Hello, I am curious if it is possible to mix the pistachios into the candy (as it is in the store-bought one I know) and not roll it as you did it. Do you have any suggestions? Thank you in advance. I would like to make it for my brother’s-in-law birthday. Haven’t tried it that way. But I think you can. Just try to be quick when mixing as it gets thick so fast after reaching that certain temperature. I just found on Fahriye’s kitchen site that in a paste mixture should be only 90gr of corn starch not 1 1/4 cup of corn starch. That’s why my mixture was so hard… It’s explains then. She has in her finished product coating 11/4 of corn starch. I will try again maybe it will work out this time. I wish I can attach pictures i made of my delightful mess 🙂 Then you will see what I am talking about. What type of corn starch are you using? My Is non GMO corn starch. It was a lot when sugar mixture and corn starch started to thicken up. I took electric mixer to help mixing better and then it started to stick to the bottom of the pot…. Yes, I even speak some Turkish too. I learned when I worked there, plus before I worked in Turkish Hotel as a manager. I am very fast leaner. Can I ask a question, Where IN Turkey do you live? I was in Istanbul and Marmaris. I wish one day me and my husband go there. Well I made this stuff which hard to name ” Turkish delight “and through away in the garbage. It was just extremely thick white wall paper paste. It seems like corn starch never cooked through. Tasted horrible too. After almost 2,5 hours cooking time it was still white thick paste. I think 11/4 cup of corn starch is way too much. I watched videos from Turkish channels how they make Loukum their was clear golden liquid gel not like my paste. So, tell me please what I did wrong because I followed your recipe exactly. Please help me, I really want to learn to do it. I can’t find it anywhere here in USA. I have a question. I don’t quit understand how much cornstarch should be inside the mixture 1 cup or 1 1/4 cup with 250 ml of water? Or it’s 1 cup inside and 1/4 cup for coating? I have everything for this recipe in the house right now. I’m going to make it. Lokum is one of my favourite candies and I need to test out my new candy thermometer. Thanks for the perfect excuse! harika görüntüler ve harika bir lezzet.ben türkiyede yaşıyorum ama krem tartarı bulamıyorum.birçok aktara sordum ama yok. Teşekkürler Eylem Hanım. Ben krem tartarı arifoğlunun satış dükkanından almıştım. Yaşadığınız şehirde varsa oraya bir sorun. Fabulous! I was just talking about this yesterday with another chef. It seems a bit of a labor, but certainly a labor of love. I adore Turkish Delight! Thanks for posting. Did it turn out chewy like store bought Turkish Delight or not? Pictures look very good. I tried so many times but my would swet and will become gloopy mass and not like real turkish delight. I am really in Love with Turkey and it’s culture I was there few times. Hi Ruzanna, it is chewy yes. These are just like store bought Turkish delight, maybe a bit softer. As for your question, combine 1 and 1/4 cups corn starch with cream of tartar and remaining water until smooth. You need extra 1/4 cup cornstarch for coating. I’d love to hear the result if you try. Chok Teshukerler! I tried so many times recipes from Internet and it always was sweaty mass which would turn in to watery goop after I coat it with powdered sugar and cornstarch mixture. And it always called for 4 cups of sugar… Maybe since in your recipe just 2 cups it’s so chewy gummy looking. I ruined at least 10 times and gave up until I saw your pictures. That looks amazing! I am literally obsessed with Turkey and it’s cuisine. I even watch Turkish soaps here in USA. I worked many years ago in Marmaris and I am in love with your country. Dream again when I can visit again. I have many friends living in Turkey too. I will try it again following your recipe and tell you about results. P.S. One more question, do you have to boil cornstarch and cream of Tartar mixture or it should be in a milk form poured into hot sugar syrup? It’s my pleasure if I can bring your memories when you were in Turkey. Our cuisine is full of addictive foods, isn’t it? You sound like half Turkish. Hope you you will be satisfied with he result when you try my recipe. 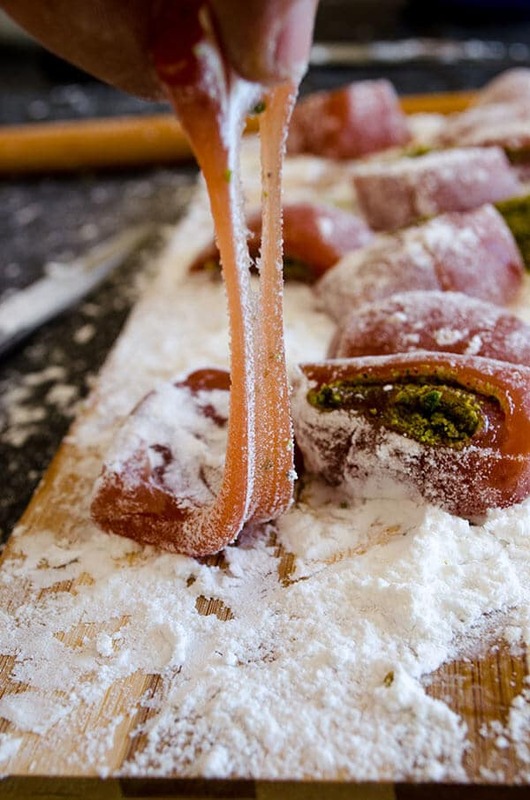 I was surprised to have that good homemade Turkish delights when I first tried this recipe. My second try was even better. As for your question; don’t boil cornstarch, cream of tartar and water mixture. You will add this into the simmering syrup, but not at once. You need to warm the cornstarch mixture up before pouring it into the syrup. Pour 1 ladle of syrup into the cornstarch mixture and stir quickly, repeat this a few times until the cornstarch mixture gets warm. Then gradually pour it into the simmering syrup and stir contiually.